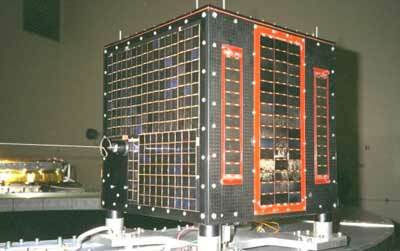 TUBSAT-A (Technische Universität Berlin Satellit A) is a cube of 38 cm side length and a mass of 35 kg. It was launched on June, 17th 1991 on the Ariane ASAP structure from Kourou together with ERS 1 and three other microsatellites. Its sun synchronous orbit has an altitude of 780 km and an inclination of 98°. The mission of TUBSAT-A is mostly technology demonstration. Experimental solar cells provide part of the energy needed, but standard cells are used on four sides of the cube. On the top you can see two L-Band patch antennas of the satellite which are also experimental. A transputer chip (Kayser-Threde) is also tested for space environment qualification. For the development of the next satellites a star sensor as well as a coil are flown. In operation the most used feature, after doing the planned technology demonstration experiments, is store and forward communications with handheld ground stations. Several Arctic and Antarctic expeditions were equipped with these devices and used them extensivly. After more than 9 years in orbit, the satellite was still complete operational. TUBSAT A was developed and built by the Institut für Luft- und Raumfahrttechnik at the TU-Berlin.